I want this to be as clear as possible so you know exactly what you Do and DON’T get when you buy a site from me. The basic web design package I offer is exactly that, a basic website for small businesses. I’ve included the things I believe the average small business owner needs. But I haven’t include any bells and whistles that complicate the maintenance of your site and cost you more. I designed this package for small businesses, sole traders and freelancers. A four page WordPress website. 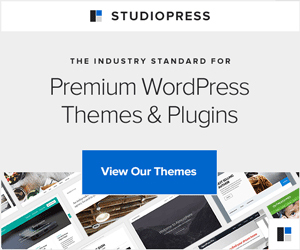 The Genesis framework and a StudioPress theme. You don’t have access to the StudioPress support site. Basic on page SEO targeting one search term. Up to ten of your photos uploaded to your site. Google analytics code embedded in your website (you need a free Google analytics account to do this). You DO NOT get plugins installed. However, most plugins are easy to install. If you want to add plugins I’m happy to help. Ask for a quote. You DO NOT get free web hosting, HostGator offer excellent hosting for about £50.00 for the first year. You DO NOT get a free domain name. This costs about £5 per year. You DO NOT get telephone support. However I offer reasonably priced updates and maintenance to sites I’ve made. You DO NOT get automatic backups, but you can make a full site backup at any time using your cPanel, if you have a HostGator web hosting account. Below you will find some extra features that do NOT come as part of the basic web design package but you might want to add. Convert existing web pages to WordPress. Usually £5 per page. Ask for a quote. Other extras you might want to consider. Backup buddy. This is an easy to use backup system, however if you use HostGator you can make good basic backups for free. Email newsletter sign-up form in your site. If you use an automated newsletter service you may want to add an easy way for site visitors to join your list. Ask for a quote. Installing plugins, ask for a quote. Plugins add bells and whistles to your site. There are thousands of plugins available for WordPress. Many of these are free but some of the better ones need to be paid for. I’m happy to set up many of the common plugins for you but the price varies on the complexity of the individual plugin. I don’t set up e-commerce plugins at the moment. Basic web graphics, ask for a quote. I’m not Michael Angelo but I can make most of the buttons and badges you see on the internet. If you’ve seen something you like, just ask and I’ll tell you if I can make something similar and how much it would cost.